We have officially launched our latest mobile healthcare unit with a VIP guest undertaking the ribbon-cutting duties. 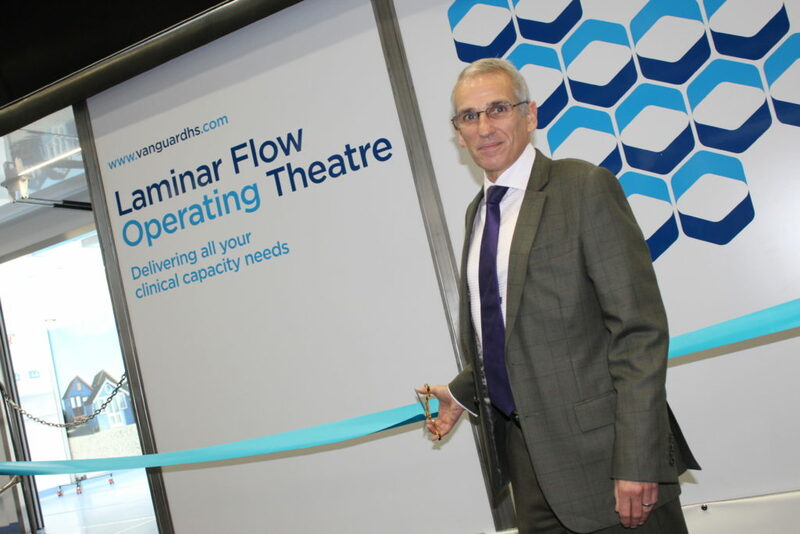 In his first duty in his role as the new President of IHEEM (Institute of Healthcare Engineering and Estate Management), Ian Hinitt welcomed visitors to the brand-new mobile clinical facility at industry conference and show Healthcare Estates, held in Manchester this month. Unveiling the latest model to join the Vanguard fleet, Mr Hinitt said: “It’s a pleasure to join the team from Vanguard Healthcare Solutions to help them launch the latest model joining their expanding fleet of mobile healthcare facilities. “As a growing organisation, Vanguard continues to bolster the range of number of units it offers. “What you see here today is their brand-new laminar flow theatre. It joins the ranks of existing facilities such as mobile theatres, endoscopy suites, day surgeries, wards and clinics and mobile endoscopy decontamination units. “These are deployed all over the UK, and in fact, across the globe. They add capacity, they assist in emergency situations as well as in planned refurbishments. “With each new iteration or extension to the fleet, it is important new units reflect what is needed in the sector, which this new laminar flow theatre certainly does. To mark the launch, Vanguard hosted a series of workshops and information sessions for professionals working in the industry as well offering tours of the new unit over the two days at the Healthcare Estates conference and exhibition. Over the two days more than 300 people enjoyed tours of the theatre. Our mobile clinical units can increase clinical capacity in both planned and emergency situations and can help with reducing procedure waiting times. Alongside our temporary mobile clinical environments such as operating theatres, endoscopy suites, day surgery, clinics and ward space which help healthcare providers, including the NHS, increase patient capacity and clinical space, Vanguard also provide highly trained support staff. Complete solutions are available through Vanguard, including enabling works and connecting corridors, along with individual unit development and staffing.